Obituary – Marshall, Frank Charles « Perry High School Alumni Association, Inc.
Director Orchestra ’18, ’19, ’20, ’21; Glee Club ’18, ’19. ﻿Frank C. Marshall, 83, resident of the Progressive Apartments, died at 6:40 a.m. Monday at St. Anthony’s hospital at Oklahoma City where he was admitted Sunday. Funeral service will be at 10 a.m. Thursday at Parker Funeral home. Rev. Ward J. Pankratz, pastor of St. Rose of Lima Catholic church, will officiate. Burial will be at Grace Hill cemetery. Marshall was born Aug. 19, 1900, at Aboca, Wisc. 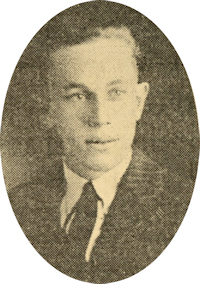 He was a 1922 graduate of Perry high school. Marshall and Helen Patrick were married at Oklahoma City in 1946. She preceded her husband in death Dec. 3,1965. Marshall was a World War II veteran, having served with the United States Navy Seabees. He was an engineer with the Oklahoma state highway department from 1945-66. Marshall returned to Perry in 1972. He was a member of the Catholic church, the Elks lodge, Knights of Columbus, the Cherokee Strip Historical Society, the Perry Chamber of Commerce and the American Legion. Marshall formerly played with the 101 Ranch band. Survivors include one son, Larry Marshall, Choctaw; a daughter, Mrs. Glen (Evelyn) Maxey, Casper, Wyo. ; two sisters, Mrs. Katherine Foster and Mrs. Dorothy Hoggatt, both of Perry; and two grandchildren.